'While economic ties are making incremental progress, it is in the security and strategic domains that the India-Japan synergy is more compelling,' says Dr Rajaram Panda. At Japanese Foreign Minister Taro Kono's invitation, External Affairs Minister Sushma Swaraj paid an official visit to Japan from March 28 to 30, 2018. Effectively she was in Tokyo for only a day as she arrived on the 28th evening and departed on the 30th morning, leaving out 29th as the only day for engagement. Broadly, her visit could be divided into two parts. The first part was her engagement with the Indian community at an event organised by the Indian embassy, to which I was invited and attended. Organised by the Vivekananda Cultural Centre at the embassy, the minister recalled the remark of the late sage Vivekananda about the virtue of Japan and why all Indians at least once should visit and see the country in their own eyes. In her address, the minister extolled the high credentials the Indian Diaspora have enjoyed in their country of settlement. In particular, she mentioned three virtues that all Indians carry with them once they leave Indian shore. These, she mentioned are, 'good neighbourly spirit, hard-working, and law- abiding', which have endeared them with the host country across continents. She also mentioned that there has been a dramatic 'transformation' in the way Indian missions function as an extended family for every Indian in their country of adoption. By coming to the help of any Indian living abroad and in distress, the minister has injected a new dimension to Indian foreign policy, which no previous foreign ministers ever achieved. In particular, she mentioned how a Tamil-speaking old lady stranded at a Malaysian airport on her way back from Australia lost her son from a heart attack and was rescued after the MEA's immediate intervention. This happened about two months ago. This was the first part. In the second part of her visit, Mrs Swaraj co-chaired the 9th India-Japan Strategic Dialogue with Kono, her counterpart, on March 29. The India-Japan Strategic Dialogue is a bilateral summit being held in India and Japan alternately since 2007. Both leaders reviewed all aspects of bilateral relations and exchanged views on regional and international issues of common interest. India and Japan concluded a Special Strategic and Global Partnership during Prime Minister Narendra D Modi's landmark visit to Japan in 2014. Bilateral relations have been strengthened in diverse sectors significantly over the last few years. Prime Minister Shinzo Abe's visit to India in September 2017 provided further impetus to ties. Backed by civilisational links, both countries have unearthed the hidden synergy in a host of areas that has fetched mutual benefits. As a result, bilateral relations have been strengthened in diverse sectors, such as in areas of nuclear energy, defence and science and technology. The big ticket project already inked between the two countries is the Mumbai-Ahmedabad High Speed Rail Project based on the Shinkansen super speed trains in Japan. The ground breaking (bhoomi pujan) ceremony of the bullet train project to be built with Japanese aid was held during Shinzo Abe's visit to India on September 14, 2017. As against the earlier deadline of 2023, a new deadline of August 15, 2022 coinciding with the 75th year of India's Independence has been set to make the project operational. India is the major beneficiary of Japan's soft loans disbursed through the Japan International Cooperation Agency to the tune of $23.36 billion, emerging as JICA's largest recipient since 2008. The biggest component of the loan amount has gone to the bullet train project. Japan is also today one of the largest investors in India, with a growing presence in infrastructure projects, manufacturing, financial markets and capacity-building, among others. Japanese FDI in India has seen steady growth. Japanese FDI during 2016-2017 totalled $4.7 billion, an increase of 80 per cent over the previous year. However, bilateral trade totalled $13.61 billion in 2016-2017, a decrease of 6.21 per cent from the previous year's figure of $14.51 billion. While India's exports to Japan for 2016-2017 were $3.8 billion, India's imports from Japan for the same year accounted for $9.76 billion. The doubling of the trade deficit during 2013-2014 ($6.81 billion) and 2016-2017 ($3.85 billion) is a matter of worry that both nations need to address. The troubling aspect on the trade front is that the Comprehensive Economic Partnership Agreement signed in 2011 has not been able to address this trade imbalance. India needs greater market access to more of its products to Japan if this trade imbalance issue has to be resolved. The case of Japanese auto major Nissan invoking the international arbitration clause in the CEPA to recover unpaid tax refunds to the tune of $770 million and the case being stuck in the Chennai high court for a settlement sends a negative signal to Japanese companies to do business with India. The government's policy intervention is urgently needed to restore the risk of losing faith in business. The nuclear issue is a sensitive one in Japan since its Hiroshima experience. The anti-nuclear sentiment further gained strength after the Fukushima nuclear disaster. Because of public disapproval, Japan was forced to shut down all its nuclear reactors, rendering nuclear energy as a source of its power to zero. Its stated policy is not to trade with any country that is not a signatory to the Nuclear Non-Proliferation Treaty. India's position is that the NPT is a discriminatory treaty which it refused to sign, but upholds its commitment to a moratorium to conduct any further nuclear tests. After sustained negotiations, Japan was convinced about India's credentials and the civil nuclear deal was clinched in 2016, paving the way for nuclear commerce between the two countries. This allows Japan to export nuclear power plant technology to India besides helping in nuclear waste management. This demonstrates the trust both nations share. While economic ties are making incremental progress, it is in the security and strategic domains that the India-Japan synergy is more compelling. Given the talks about the revival of the quadrilateral dialogue between Japan, the United States, Australia and India to counter China's increasing muscle flexing in the South China Sea, and to ensure navigation rights in the Indo-Pacific region, Minister SSwaraj's visit assumes special significance. Japan is also a partner in the Malabar exercises which India has been conducting with the US since 2002. Soon after her return, the minister will visit China to participate in the Shanghai Cooperation Organisation foreign ministers meeting, ahead of the SCO summit that is expected to be attended by Prime Minister Modi in the Chinese city of Qingdao in June. Exchanging yen loan agreements for $1.4 billion, Kono underlined India as Japan's 'most important' partner in its 'Free and Open Indo-Pacific Strategy'. Besides bilateral trade, Japanese loans for important projects such as the Mumbai metro line from Cuffe Parade, a sea water desalinisation plant and an intelligent transport system to reduce traffic congestion in Chennai, tree planting schemes in Himachal Pradesh as well as loans for the North East Connectivity project were major highlights in the discussion. The respective envoys signed and exchanged notes concerning the provisions for four yen loan projects. Mrs Swaraj also called on Fumio Kishida, chairman of the Liberal Democratic Party Policy Research Council and a former foreign minister. The level of trust and friendship that both nations share with each other is demonstrable from the fact that India chose Japan as the only foreign nation to participate in development projects in India's north east, a critical part of its Act East policy, which aims to ramp up economic, cultural and political connectivity linkages between the region and Southeast Asia. As the foreign minister mentioned, there is no issue of conflict between the two countries, only of cooperation and this has maintained the momentum in the relationship. The observations Abe made when he addressed the Indian Parliament during his first term as prime minister in 2007 -- 'A strong India is in the best interest of Japan, and a strong Japan is in the best interest of India' -- still resonates and remain the cardinal philosophy of conducting relations between the two countries. Irrespective of the change of governments in both India and Japan, there has been continuity in policy on both sides. Sushma Swaraj's predecessors S M Krishna and Salman Khurshid extensively worked for furtherance of India-Japan ties, to which Mrs Swaraj has provided an additional push. Then prime minister Manmohan Singh hosted Prime Minister Abe as the chief guest at the Republic Day parade in 2014. The several joint maritime exercises, agreements on sea cooperation, cooperation in large-scale energy and infrastructure and developmental projects are testimony of the strong India-Japan bonding, the larger impact of which can be felt in the Asia-Pacific narrative. Both India and Japan have also stood their ground together to combat terrorism and extremism that oppresses South Asia. As a counter to China's Belt and Road Initiative, both India and Japan are working together to establish the Asia-Africa Growth Corridor. This could have figured in the Sushma-Kono discussion. The external affairs ministry announced that all aspects of bilateral relations and views on regional and international issues of common interests were to figure in the strategic dialogue. 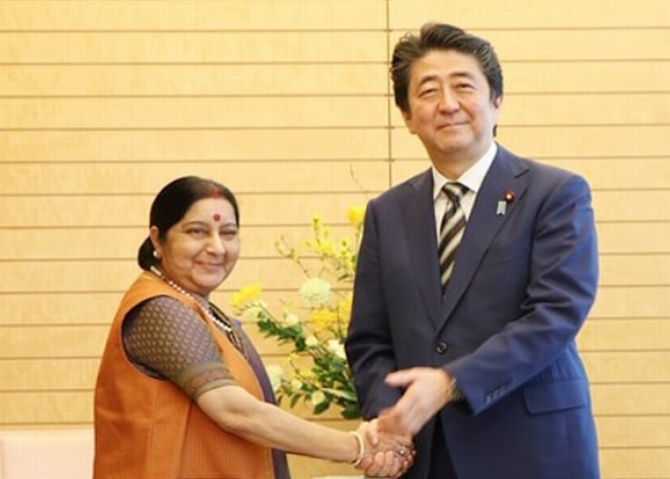 In short, Swaraj's Japan visit sets the agenda for Modi's annual India-Japan summit with Abe towards the end of this year. Dr Rajaram Panda is ICCR India Chair Visiting Professor at Reitaku University, Japan. The views expressed are personal and do not represent either of the ICCR or the Government of India.